When I lived in London, I couldn’t get a taxi for love or money that would venture north of the river. I never understood their reasoning. OK, so what if it was 15kms, it was the same city and I was a paying fare. During the 18 months I’ve been living in Sydney, I’ve noticed a bit of a north-south divide here too. When I mentioned to my sister-in-law we were planning a day trip to Sydney’s Northern Beaches from our Eastern Suburbs ‘hood’ she joked that we’d need our passports. Having just returned from our day to the north side, I only wish we’d done it sooner. It’s so good to take a day out with the family and discover a new area – so good in fact, we didn’t get home until 8pm. Our day ‘north of the bridge’ was prompted by our plan to lunch at Avalon on the Beach, an oceanfront restaurant and café located right on Avalon’s beach. As you’d expect from a venue right on Avalon’s perfect curved stretch of sand and overlooking the rolling surf, the views are to-die-for. That first glimpse of the ocean through the floor-to-ceiling windows that stretch across the front of the space is breathtaking. 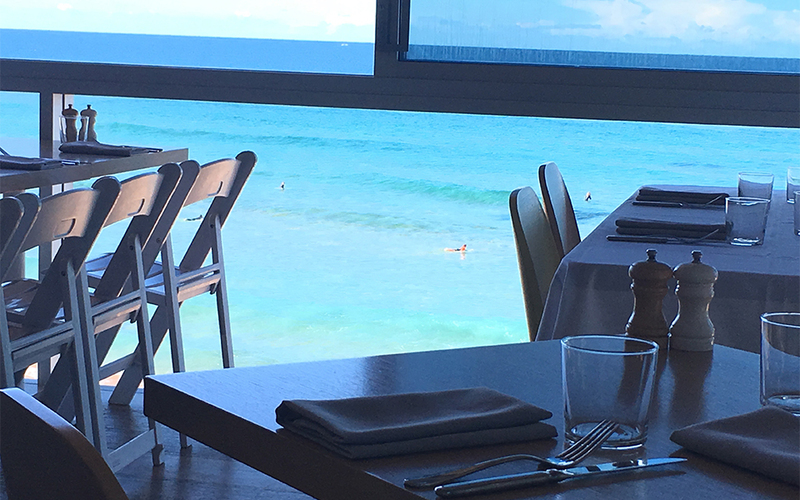 We’d picked a gloriously sunny and warm winter’s day so the windows were open, giving flawless views towards the surfers and beyond. During the migrating season, it’s a great place to look out for migrating whales. Very seldom do we attempt a restaurant dining experience with our 3 year old. When you’ve got young children, a stuffy atmosphere, over-complicated food and any concern over not being welcome will ruin the experience. Avalon On The Beach avoids all of those things. The team of staff were friendly and welcoming and immediately put us at ease. Yes, a few of the wooden tables had tablecloths, but this restaurant does not feel stuffy at all. It’s bright and airy and as the space filled up with customers, it had a relaxed buzz of conversation and laughter. There was a real mix of customers; families, couples and two larger tables celebrating a special occasion. with yuzu dressing and a confit salmon with sautéed kale, fresh chilli, garlic, capers, anchovies, ponzu dressing and wasabi mayo. 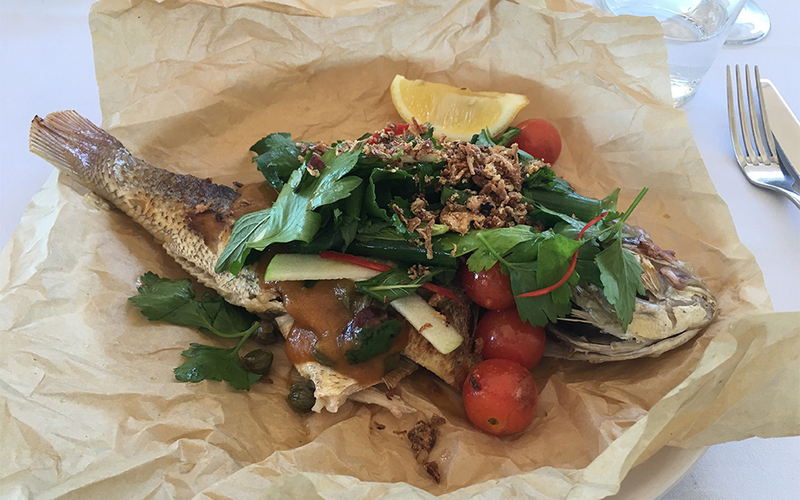 I chose the whole plate snapper that was topped with a deliciously fresh and fragrant salad of cherry tomatoes, slivers of apple, chilli, herbs and a superb sweet and sour dressing. It was divine. ($33). My vegetarian husband opted for a goat’ s cheese, pear and walnut bruschetta ($14) which I couldn’t resist trying. The combination of perfectly toasted sourdough, smooth creamy cheese, sweet crunchy pears and tangy wholegrain mustard dressing was heavenly. He followed with a generous main serve of porcini mushroom risotto ($22). There were a couple of other veggie options to choose from, plus plenty of gluten free dishes. My son’s face lit up when I read him the Little Nippers kids’ menu. I didn’t need to continue once I’d mentioned Calamari and Chips ($9) which was the perfect-sized portion of tender battered calamari served with crunchy French fries. 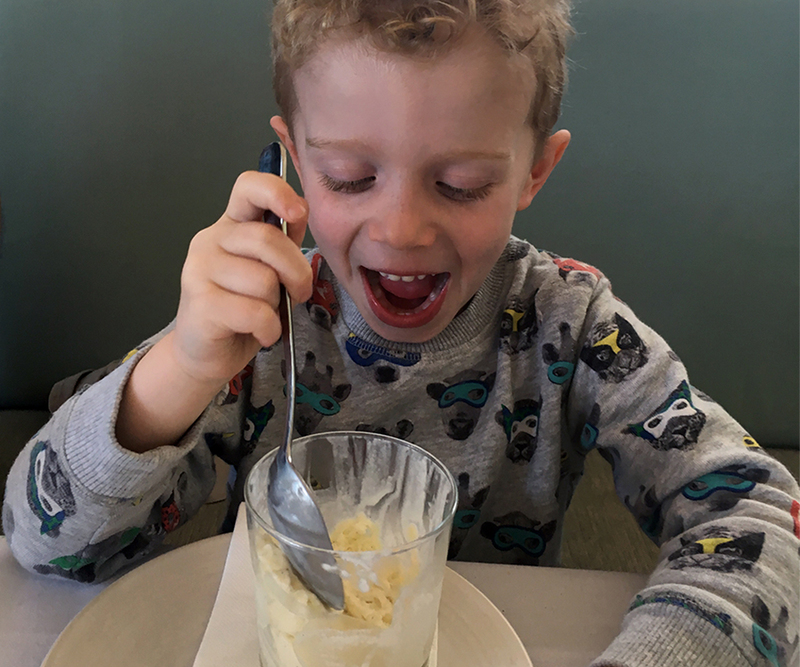 He also had enough room for a grown up serve of vanilla ice cream – his face said it all! We don’t normally opt for desserts but the menu was too tempting. 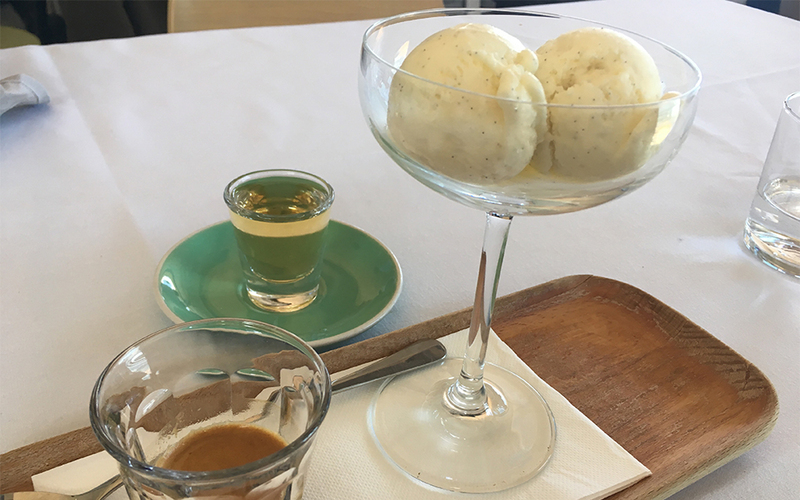 We had a beautifully-presented rum and vanilla panna cotta served with a scoop of the most sensational cinnamon ice cream and the affrogato – vanilla ice cream served with a robust shot of espresso and frangelico – boom! There’s a great choice of wines by the glass and the bottle. We enjoyed a beautiful glass of Verdelho and a tangy Sauv Blanc. There’s also a great cocktail menu, perfect for sundowners. 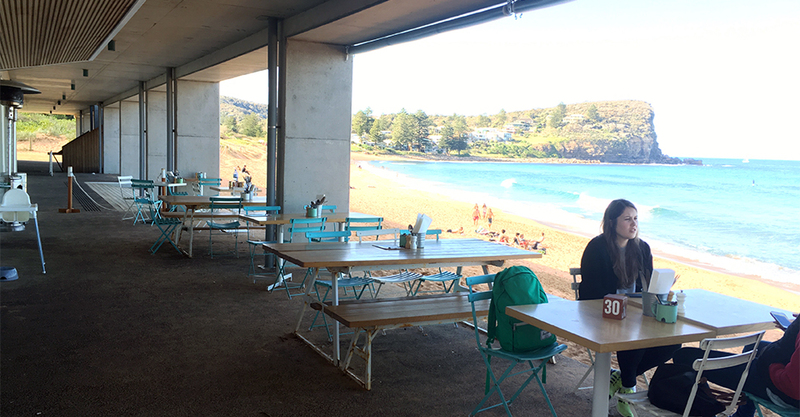 On the ground floor, outside but covered, you’ll find ‘The Kiosk’ café with tables right next to the beach. It’s a great alternative option for families looking to eat or drink here. If your kids are happiest when they’re not restricted to sitting at a table – this is perfect. Let them play in the sand while you keep a watchful eye on them and chow down on delicious brunch, lunch and snack options. What’s more, the manager shared some exciting news. The Kiosk is applying for a license (if all goes through on schedule, before summer) which will allow them to serve beers and wine to parents looking for a stunning location to enjoy a chilled drink with their kids. I’m envious of anyone that lives close to Avalon on the Beach. It’s somewhere fabulous to dine, whether it’s for breakfast, lunch or dinner. The restaurant is somewhere I’d definitely recommend for a birthday, anniversary or other special occasion. For something more relaxed, I’d opt for The Kiosk. It’s the type of place you’d feel comfortable at after a swim and your kids will be able to play and run around in the sand while you watch them. If you’re not local, it’s definitely worth planning at trip and making a day of it. What Makes It Family-Friendly – it may not have a dedicated kids area but this restaurant is really welcoming to families. There’s a nice kids’ menu and it’s easy to put together a small bag of toys and colouring-in books to keep the kids amused. 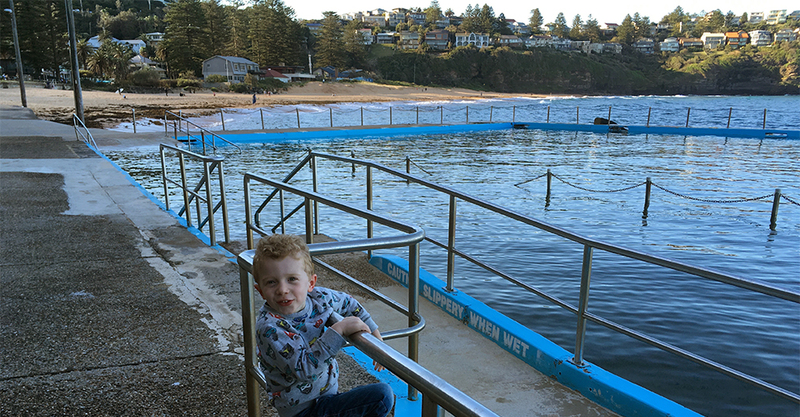 Not forgetting that huge sandpit and swimming spot – Avalon Beach – right next door! The Food – top marks! Fresh, quality ingredients with lots of seafood options. The snapper was the highlight for me. Special Features– The Kiosk downstairs was a complete surprise. 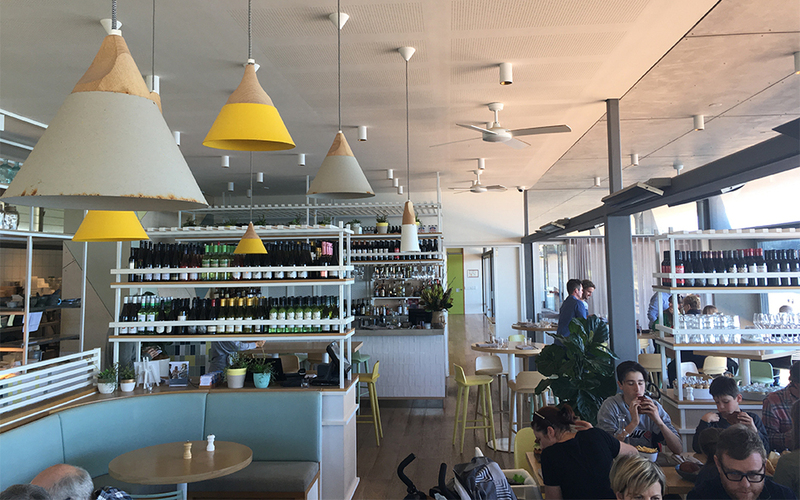 What a fabulous place for an easy-going brunch, lunch or snack after a trip to the beach. And once they get their licence, a great place for a chilled glass of vino overlooking the surf while the kids play in the sand. Best Suited For – if you want to treat your family to a special lunch or you’re celebrating a special occasion this is the place. It really does have a broad appeal, attracting couples, groups, families, the young and the old. 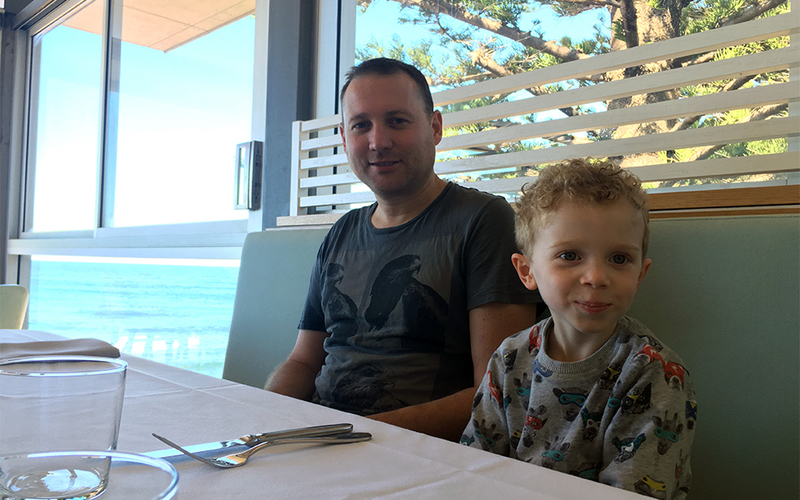 Highlights– the incredible views, the delicious fresh, unpretentious food and the satisfaction of actually enjoying a top-notch lunch in a stylish restaurant with a 3 year old without any dramas or hassles. If you don’t live locally, I’d highly recommend taking a whole day to experience this stunning area. Beat the traffic, leave early and take time to explore the area before and after your lunch. We spent an hour or so exploring Avalon Beach before our lunch. Even during winter when the water is a bit chilly, there is lots to do…some great rockpools to investigate and a playground on the reserve. During warmer months, there’s a saltwater pool at the southern end of the beach. Since this was new territory to us, we decided to do a reccie of the beaches in the area after lunch. 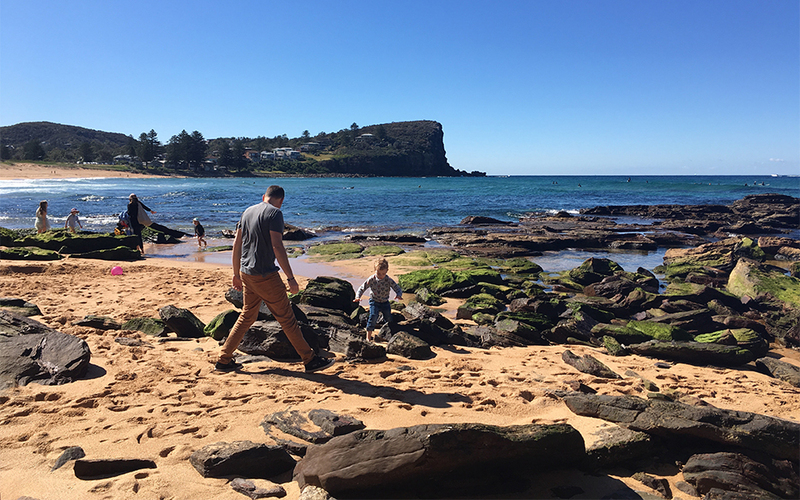 It coincided with a much-needed nap in the car for my son so we managed to cover a loop starting at Palm Beach onto Whale Beach and finishing up at Bilgoa Beach, when my son woke up and had a good run around. 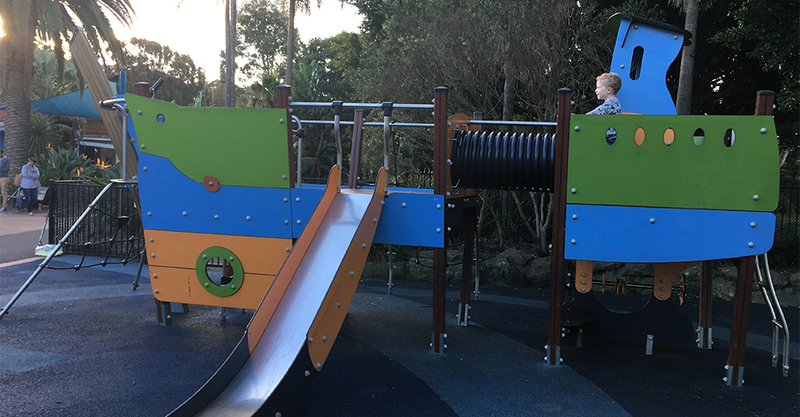 We managed to squeeze in a final trip to Winneramy Playground Mona Vale – otherwise known as the Flying Fox Playground. It lived up to its reputation – it’s awesome. A huge enclosed play area with equipment for all ages from tots to teens and a café where we got a great coffee to get us home! Opening Times: The Avalon on the Beach (restaurant on first floor) is open for breakfast on weekends (from 9am), lunch Wednesday to Sunday and dinner Wednesday to Saturday. The Kiosk (café on ground floor) is open from 8am to 4pm Wednesday to Sunday. Love this place, great food and coffee!